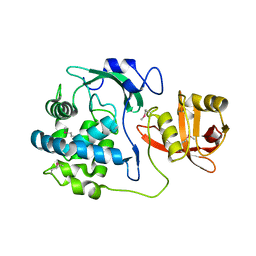 2.05 ANGSTROM RESOLUTION CRYSTAL STRUCTURE OF EPIDERMIN LEADER PEPTIDE PROCESSING SERINE PROTEASE (EPIP) FROM STAPHYLOCOCCUS AUREUS. 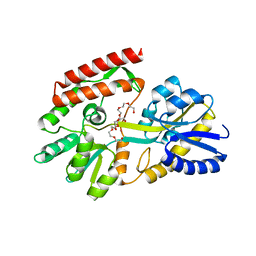 Cite: 2.05 Angstrom Resolution Crystal Structure of Epidermin Leader Peptide Processing Serine Protease (EpiP) from Staphylococcus aureus. 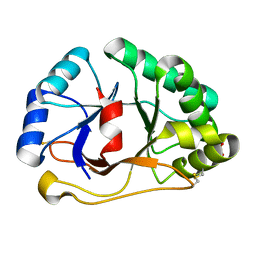 Cite: 2.05 Angstrom Crystal Structure of Putative 5'-Nucleotidase from Staphylococcus aureus in complex with alpha-ketoglutarate. 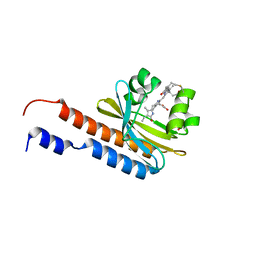 2.2 ANGSTROM RESOLUTION CRYSTAL STRUCTURE OF SUPERANTIGEN-LIKE PROTEIN FROM STAPHYLOCOCCUS AUREUS SUBSP. AUREUS NCTC 8325. 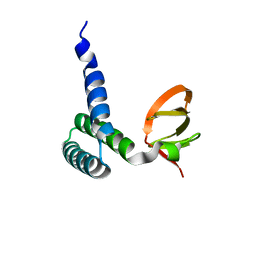 Cite: 2.2 Angstrom Resolution Crystal Structure of Superantigen-like Protein from Staphylococcus aureus subsp. aureus NCTC 8325. 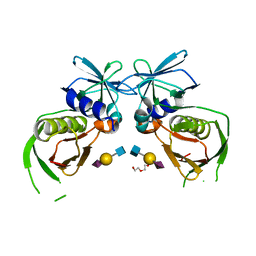 Cite: 1.5 Angstrom Crystal Structure of the Complex of Ligand Binding Component of ABC-type Import System from Staphylococcus aureus with Nickel and two Histidines. 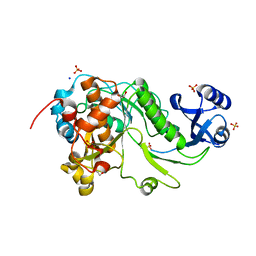 Cite: 1.95 Angstrom Resolution Crystal Structure of Epidermin Leader Peptide Processing Serine Protease (EpiP) S393A Mutant from Staphylococcus aureus. 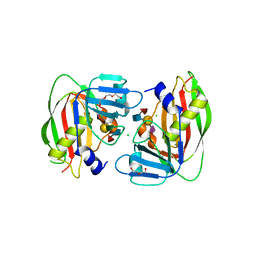 Cite: 2.0 Angstrom Crystal Structure of Ligand Binding Component of ABC-type Import System from Staphylococcus aureus with Zinc bound. 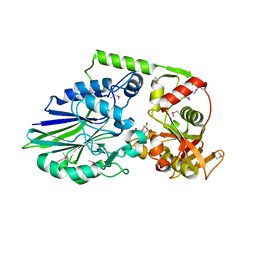 2.4 ANGSTROM CRYSTAL STRUCTURE OF SUPERANTIGEN-LIKE PROTEIN FROM STAPHYLOCOCCUS AUREUS. Cite: 2.4 Angstrom Crystal Structure of Superantigen-like Protein from Staphylococcus aureus. 2.6 ANGSTROM STRUCTURE OF THE EXTRACELLULAR SOLUTE-BINDING PROTEIN FROM STAPHYLOCOCCUS AUREUS IN COMPLEX WITH PEG. Cite: 2.6 Angstrom Structure of the Extracellular Solute-binding Protein from Staphylococcus aureus in complex with PEG. 2.25 ANGSTROM STRUCTURE OF THE EXTRACELLULAR SOLUTE-BINDING PROTEIN FROM STAPHYLOCOCCUS AUREUS IN COMPLEX WITH MALTOSE. Cite: 2.25 Angstrom Structure of the Extracellular Solute-binding Protein from Staphylococcus aureus in complex with Maltose. 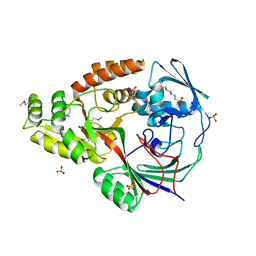 1.98 ANGSTROM CRYSTAL STRUCTURE OF PUTATIVE 5'-NUCLEOTIDASE FROM STAPHYLOCOCCUS AUREUS IN COMPLEX WITH ADENOSINE. Cite: 1.98 Angstrom Crystal Structure of Putative 5'-Nucleotidase from Staphylococcus aureus in complex with Adenosine. 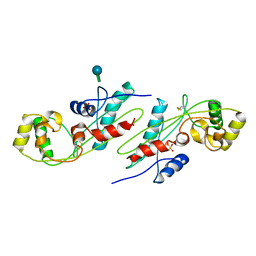 2.3 ANGSTROM CRYSTAL STRUCTURE OF HYPOTHETICAL PROTEIN FTT1539C FROM FRANCISELLA TULARENSIS. 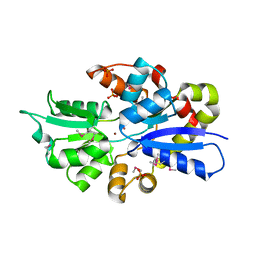 Cite: 2.3 Angstrom Crystal Structure of Hypothetical Protein FTT1539c from Francisella tularensis. 1.9 ANGSTROM CRYSTAL STRUCTURE OF SUPERANTIGEN-LIKE PROTEIN, EXOTOXIN FROM STAPHYLOCOCCUS AUREUS, IN COMPLEX WITH SIALYL-LEWISX. 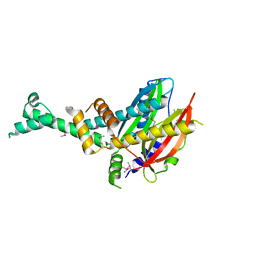 Cite: 1.9 Angstrom Crystal Structure of Superantigen-like Protein, Exotoxin from Staphylococcus aureus, in Complex with Sialyl-LewisX. 1.93 ANGSTROM CRYSTAL STRUCTURE OF SUPERANTIGEN-LIKE PROTEIN FROM STAPHYLOCOCCUS AUREUS IN COMPLEX WITH SIALYL-LEWIS X. 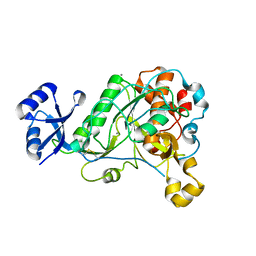 Cite: 1.93 Angstrom Crystal Structure of Superantigen-like Protein from Staphylococcus aureus in Complex with Sialyl-Lewis X. 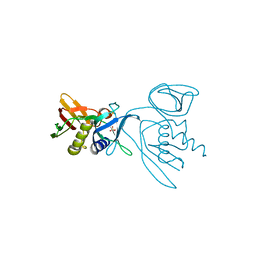 2.0 ANGSTROM CRYSTAL STRUCTURE OF SUPERANTIGEN-LIKE PROTEIN FROM STAPHYLOCOCCUS AUREUS IN COMPLEX WITH 3-N-ACETYLNEURAMINYL-N-ACETYLLACTOSAMINE. 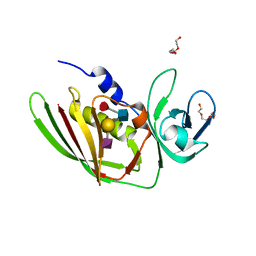 Cite: 2.0 Angstrom Crystal Structure of Superantigen-like Protein from Staphylococcus aureus in Complex with 3-N-Acetylneuraminyl-N-acetyllactosamine. 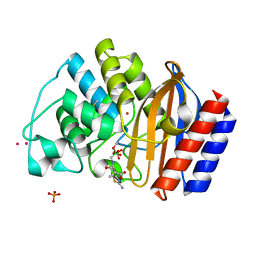 2.9 ANGSTROM CRYSTAL STRUCTURE OF PUTATIVE EXOTOXIN 3 FROM STAPHYLOCOCCUS AUREUS. 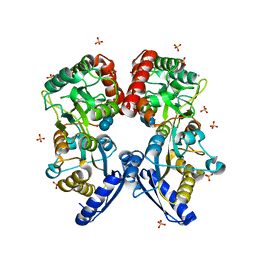 Cite: 2.9 Angstrom Crystal Structure of Putative Exotoxin 3 from Staphylococcus aureus. 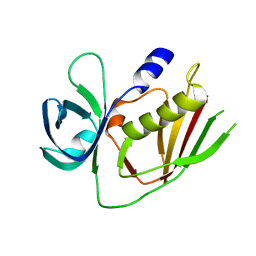 1.75 ANGSTROM CRYSTAL STRUCTURE OF SUPERANTIGEN-LIKE PROTEIN, EXOTOXIN FROM STAPHYLOCOCCUS AUREUS, IN COMPLEX WITH SIALYL-LEWISX. 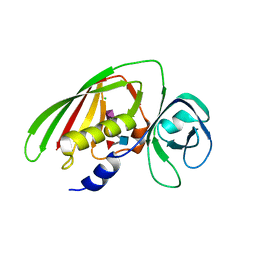 Cite: 1.75 Angstrom Crystal Structure of Superantigen-like Protein, Exotoxin from Staphylococcus aureus, in Complex with Sialyl-LewisX. 2.15 ANGSTROM CRYSTAL STRUCTURE OF N-ACETYLMURAMOYL-L-ALANINE AMIDASE FROM STAPHYLOCOCCUS AUREUS. 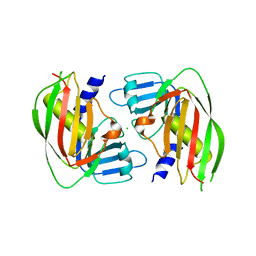 Cite: 2.15 Angstrom Crystal Structure of N-acetylmuramoyl-L-alanine Amidase from Staphylococcus aureus. 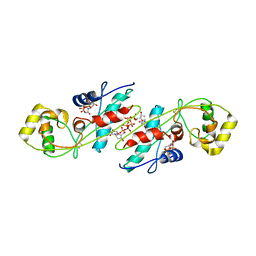 Authors: Minasov, G., Teplova, M., Nielsen, P., Wengel, J., Egli, M.
Cite: Structural basis of cleavage by RNase H of hybrids of arabinonucleic acids and RNA. 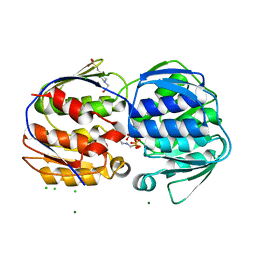 Cite: Functional implications from crystal structures of the conserved Bacillus subtilis protein Maf with and without dUTP. 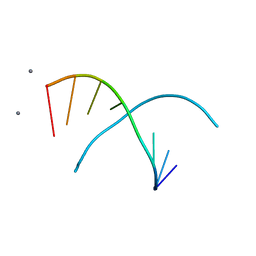 Authors: Minasov, G., Matulic-Adamic, J., Wilds, C.J., Haeberli, P., Usman, N., Beigelman, L., Egli, M.
Cite: Crystal structure of an RNA duplex containing phenyl-ribonucleotides, hydrophobic isosteres of the natural pyrimidines. Authors: Minasov, G., Wang, X., Shoichet, B.K. 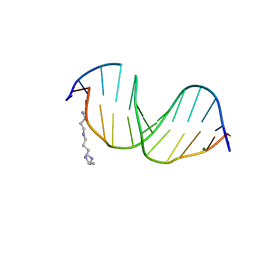 Cite: An ultrahigh resolution structure of TEM-1 beta-lactamase suggests a role for Glu166 as the general base in acylation.